X-Small - $44.99 Only 5 left! Small - $44.99 Only 9 left! Medium - $44.99 Large - $44.99 Only 9 left! X-Large - $44.99 Only 5 left! Some people just don’t get it. The American Flag isn’t just some scrap of cloth that waggles in the wind, although it does do a rather fine job of that. It’s a symbol of justice, equality, and independence! It’s symbolic of the rich history cultivated in the United States over these last couple hundred years! Just thinking about it fills some people up with a strong sense of patriotism and pride! Whew… just thinking about it makes us feel moved! 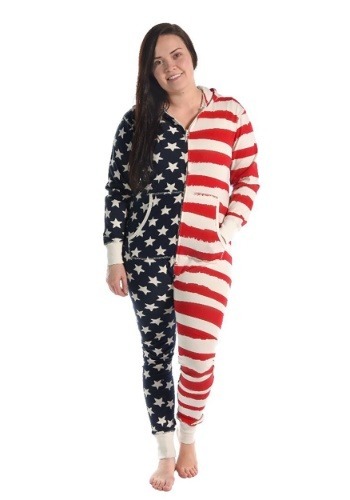 Are you one of those patriotic people? Do you have a strong sense of liberty, justice and the American way? Do you look really great in red, white, and blue? Have you been yearning for an outfit that reflects your inner ideals while keeping you ultra-comfortable? Finally, an outfit that makes you look on the outside, exactly the way you feel on the inside! 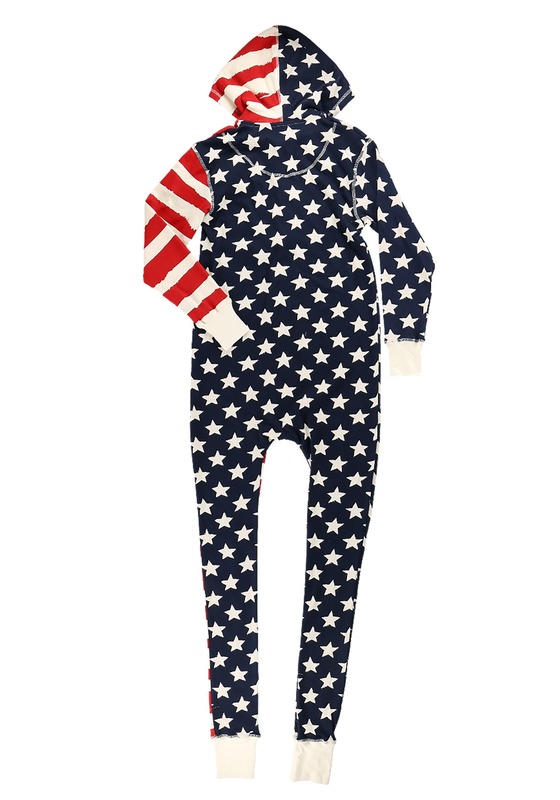 This patriotic onesie is made out of comfy cotton and fits with a zipper in front. It has an attached hood, rib-knit cuffs, and a pouch in front. But now, enough of that boring stuff. Let’s get to the feature that you really care about. Stars and stripes. A lot of them. 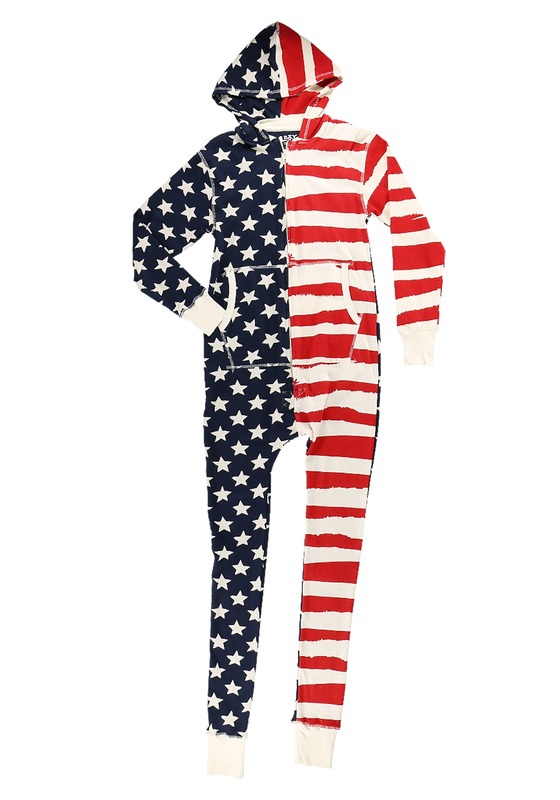 One half of this jumpsuit is covered in red and white stripes. The other half? You guessed it—a swath of deep, navy blue, and a flurry of glorious stars. 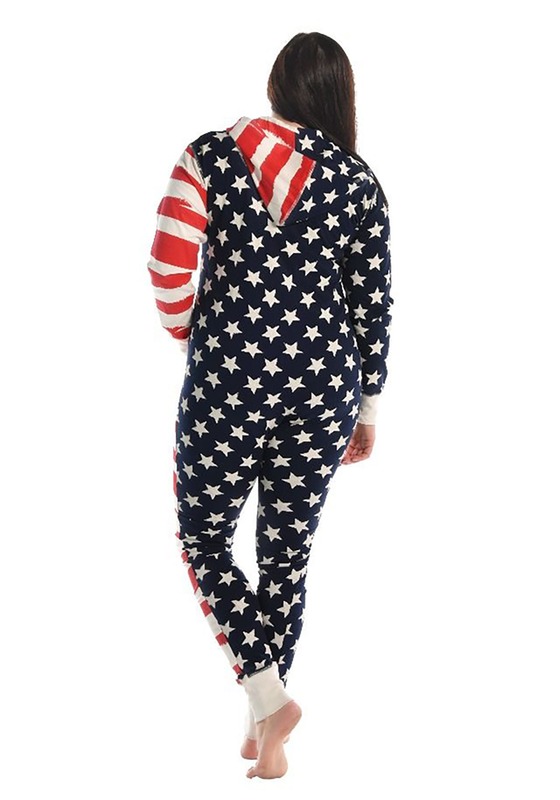 Wearing it makes you feel like the very embodiment of American values. You can wear this during the 4th of July, or use it as your new lounging outfit to fully celebrate your independence and freedom! You could even use it as an abstract Halloween costume idea. When people ask you just what you’re supposed to be, you can proudly reply, “Patriotism!” Be sure to check out some of our other great costume based on the U.S. flag fully embrace American values this year.